Why I Waited: The Criterion Collection deserves a newly inaugurated Nobel Prize for Cinema in my book, but I'm sure I'm not the only devotée who harbors dream-visions of expanding their catalog. Jan Troell's The Emigrants and its sequel The New Land, revered on their release but extremely difficult to track down these days, strike me as an ideal box-set for some well-resourced DVD imprint, especially now that Criterion is gracing Troell's more recent arthouse hit Everlasting Moments with a typically lustrous packaging. I'd hoped by the time I got around to The Emigrants that a revival-house screening or an official DVD pressing somewhere would show the film to superior advantage. As it is, I'm enormously grateful, and for the umpteenth time, to my friend Mike, who provided me with a copy of this film way back when we were first getting to know each other. We swap stuff like this the way addicts trade needles, but mercifully, the only health risks are mental. And even when I want a hit so bad I can taste it, I can resist the urge for years when I suspect it will be worth the wait. 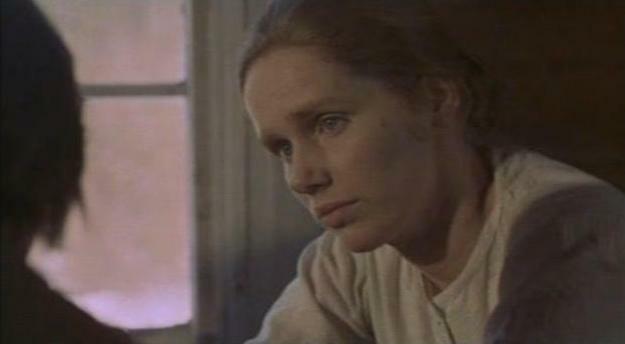 The Performance: Ironically, the two performances for which Liv Ullmann secured her two Oscar nominations are, today, two of her most impossible films to seedespite the usual axiom that the point of the Academy Awards is to ensure visibility for films that need it. Neither of them has ever appeared on DVD, unless you count the hacked-up and English-dubbed limited release of The Emigrants that Warner barely put out in 2007, minus 40 minutes of original footage. Even VHS copies are very hard to come by, and most of those are severely truncated, too. Someone will eventually explain to me the reasons for such rude treatment. Besides these headaches of ready availability, however, neither the two films nor Ullmann's performances in them have much in common. I ought to return one day to 1976's Face to Face, since I do love Bergman and I cherish any top-grade actress rendering an all-stops-out mental crackup on screen. Some people cite Ullmann's explosive charting of the mental deterioration of a Swedish psychoanalyst to be one of the greatest performances ever lensed, but the film's muddy symbolisms, the repetitions in the screenplay and the acting, and the almost lewd overvaluation of howling despair put me off a little. By contrast, Jan Troell's The Emigrantsalso a nominee for Best Picture, Best Director, and, in the previous year, Best Foreign Language Filmis a much more stately, superficially conventional chronicle of a nonetheless harrowing experience, as a party of 14 loosely related men, women, and children from the rustic Småland province of Sweden decide to take their chances in the reputed promised land of North America. Together, they have had their fill of tyrannical employers, religious persecution, thwarted opportunities for learning, and alternately drowned and sun-blasted crops. 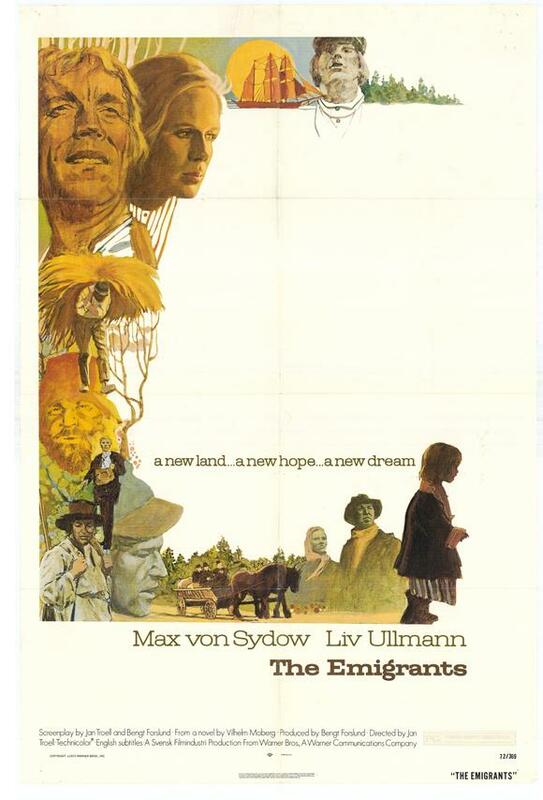 In deference to my promised focus on Ullmann's performance, I'll say quickly that The Emigrants is an absolute stunner of naturalistic historical recreation and intimate human portraiture. Balancing the majestic visual scale, the low visual contrasts, and the sedate color palettes of rural 19th-century paintings with the nervy camera movements and unsettling sound design of up-to-the-minute cinematic technique, The Emigrants is all the more impressive for the fact that Troell worked as director, cinematographer, editor, and co-adapter of Vilhelm Moberg's novels. Certainly since the Best Picture slate was shrunk down to five nominees in 1944, and perhaps not even beforehand, I don't think that category has ever again in a single year boasted four such superior movies as Cabaret, The Emigrants, The Godfather, and Sounder, which of course only makes it more frustrating that Troell's achievement cannot be more readily savored by a wider audience. But we were speaking of Ullmann, whom we first meet as a blonde-plaited girl perched lazily on a swing, itself suspended from a huge tree branch. With the light behind her and a consequent golden nimbus of backlighting tickling away at her features, Ullmann is a radiant image of youth. For a story that will lean so heavily on everyone's massive utopian investments in the myth of America, there is some irony to the fact that no one in the film ever looks as sublimely inspiring or as contentedly situated in time and placenot even once they've reached their mythopoetic destinationas Ullmann's Kristina does in these introductory shots. Kristina soon marries the young, local farmer Karl-Oskar Nilsson (Max von Sydow, or were you expecting someone else?). As she moves in with Karl-Oskar's crippled father and silent, vaguely censorious mother, Ullmann maintains a ruddy, only half-concealed vitality: seeing to her chores of milking cows and preparing food and gathering straw, but occasionally espied having a respite on yet another swing, when she probably ought to be toiling. The presence in the household of Karl-Oskar's younger, more handsome brother Robert (Eddie Axberg), a precocious reader, a riverside dawdler, equally stirred by philosophy, natural science, and faraway locales, suggests an inevitable romantic tangle. In fact, though, he and Kristina never come anywhere close. Ullmann makes subtle but quick work of suggesting the swift erosion of Kristina's restless girlishness, and her stalwart disinclination toward sin. She can still be sweet-talked into a nocturnal roll on the straw pallet she shares with Karl-Oskar, but not without suggesting that a fourth pregnancy in four years might be something to avoid, given their intractable debts and their stingy fields. Kristina is by far the most fertile thing on Karl-Oskar's farm, but she is no earth mother. Despite the initial impression Ullmann made of gorgeous, arousable mischiefmade more tranquil as the years pass, but still vaguely palpable as she, and she alone, listens with thoughtful fascination to what Robert reads aloudshe has to give Karl-Oskar the same warning that Alma gave Ennis in Brokeback Mountain against conceiving more children he has no way of feeding. She's still a smitten wife, but life has begun to sober her up. Worry has begun to nibble at her, like bedbugs that won't go away. Nonetheless, in offscreen moments, Kristina keeps relenting to Karl-Oskar's advances, and they keep adding to their brood. She is a much more pious believer than her husband, and Ullmann imparts a sense that Kristina's practical reservations about bearing a larger family are suffused with a theological fear that she is tempting God's patience by living and loving beyond her meansthat she is professing a mindfulness of resources that she is not fulfilling, or that Karl-Oskar keeps upsetting on both their behalves. She is understandably piqued, then, when Karl-Oskar reacts with glumness to her announcement of another pregnancy. Still, her heated reactionespecially in proportion to his swift self-recovery and his earnest vows of continued adorationimply that she has silently been fretting, even berating herself, well before disclosing the news to her nonplussed husband. She is rankled and scared enough by his casual blasphemies in the fields, blaming God for his own pathetic harvests, that it's a bit less surprising, though only a bit, when she holds him so severely to task after lightning strikes their only barn and burns it fully away. Ullmann holds up her hands in an etherized pose of praying after this happens, gazing stonily into the camera and toward Karl-Oskar as they jointly approach. She looks sphinxlike and serenly taunting, like one of those women who wordlessly beckon from uncanny landscapes in Tarkovsky's films. But the bizarre edge of thrill and relief that Ullmann sneaks into Kristina's fearful recriminations suggests that she'd rather pay an inevitable bill to their angered God by sacrificing a farm than by losing a child. Before long, Kristina and Karl-Oskar do lose a child through a dismal accident, and only then does she accede to everyone else's avid longings for the New World. However, she's pregnant once again by the time they leave on their grueling voyage, and it's clear that she expects still more trials from the Holy Ghost. From time to time she says as much, but it's really by watching Ullmann's uneasy pensiveness in the backs of several shots that we best track what she's feeling. Hunkered into the wagon that hauls them from their family plot to the chaotic seaport, barracked into the massive ship that is their tightly-packed home and their fetid prison for a ten-week voyage, not quite becalmed even after the ship arrives in New York City (minus several of its original passengers), Kristina typically subsists as a quietly but nervously reactive presence. Many of her close-ups are brief, wordless inserts, in which Ullmann capitalizes on her amazing knack for profound but unshowy distillation of emotion, a capacity for total expressive lucidity that has recently become the provenance of Juliette Binoche. To be sure, she gets some more volatile moments, too. She weeps in weary self-disgust when she discovers her clothes crawling with lice. She raves in desperation, looking to find a daughter who has somehow wandered off while a second passenger-boat temporarily docks. She is incensed to be traveling in the company of a prostitute named Ulrika (Nonica Zetterlund), whom her uncle, a zealous and scarily arrogant minister, praises as God's favorite child in the entire community. Why else, he asks, does Ulrika go unbitten and undiseased, even as seasickness, scurvy, and vermin infestations ripple through the rest of the ship's hold? Kristina has no answer except a fuming, almost cellular rejection of this logic, though whether she's angry with Uncle Danjel or Ulrika or herself, maybe even at God, is something for the viewer to think about throughout the tantrum and through lots of subsequent inserts of Ullmann, weary behind the eyes and obviously troubled at heart. The scenes of strenuous emoting were not my favorites in Ullmann's performance, partly because they risk being predictable reactions to generic goads (humiliation, parental fright, moral disgust), and partly because these facets of Kristina sometimes arise too quickly or too floridly. The most substantial reason, though, is that the wealth of information Ullmann conjures about Kristina even when she's doing and saying much less constitutes such an extraordinary display of unegotistical artistry that one almost hates to see Kristina pipe up. All she needs is one incongruously fretful expression while a hundred other characters are rejoicing in the finally-attained dockside of New York for us to see that Kristina is contemplating this whole journey in a different, more inward, more inviolably skeptical plane than anyone else among her company, even her husband. She's the God-fearing pilgrim among all the secular travelers, who dream of Minnesota topsoil and assimilated American consonants and California gold. Refreshingly, though, Ullmann and Troell refrain from making Kristina a hysteric or a nag, and they wouldn't dream of using her to pathologize older ways of feeling. Ullmann's concessions to period are to play Kristina as someone who expects discomfort and hard work and to retain a bone-deep consciousness of divine observation, responding to calamities or provocations not as things to be angry about but as moments to be humblealthough here again, Ullmann captures Kristina's piety while forbearing from making her meek or passive or impenetrably internalized. So many actors play period by giving their characters ornate or estranged exteriors out of step with contemporary idioms but emphasize that their hearts and minds are as modern as could be. Ullmann, though, has neatly reversed that equation. Aside from the strongly marked regional accent in her voice, she speaks, moves, and breathes with an unself-conscious immediacy unusual for performances in tales of the 1840s, and yet it's tangible at every moment that Kristina's soul measures itself by different values. Her joys and worries and expectations are those of a very different era. If she's a bit tacit, it's not because she's under her husband's thumb or in some other way "unliberated" but because she is so deeply habituated to the ways in which even the mainstays of her lifethe ground, the water, the air, her Lord, her womb, her food, her questions, her work, her dislikes, her hunches about the futureregularly resist even the hardiest work ethic, the most Christian modesty, the best attempts to manage her family or to earn God's clemency. This is why, even as I am tempted to say that Cicely Tyson's Rebecca in Sounder and Ullmann's Kristina in The Emigrants might come closer to a mutual understanding than you'd expect from any two characters in the same Oscar race, I cannot imagine Kristina being capable of that heart-stopping, plaintive, desperate, and loving sprint that Rebecca climactically takes toward her husband. Ullmann keeps Kristina vital, open, accessible, and matrimonially devoted without suggesting that she could love a husband as voluminously as Rebecca loves hers, without committing a sin of pride. In fact, when Kristina lies bloody and depleted, in the advanced stages of shipboard illness, what she offers as a dying confession to Karl-Oskar is a barely audible "I care for you very much, and always did. We're such good friends." Ullmann, who has mapped ecstatic, ambivalent, and openly hostile marriages during her storied career, is in full command of the actorly dexterity required to express such a modest, fragile emotion in a way that suits the character and the period without disappointing a modern audience's desire for emotional identification and release. She has need to wail and weep elsewhere in The Emigrants, but mostly she's defined by a placid but uncomplacent watchfulness, keeping one eye on her children and one on the uncertain future, near or far. It's hard to imagine serving The Emigrants much better than this, and if the performance feels just marginally shy of the highest heights, that speaks less to any deficiency than to Ullmann's mature contentment to fit within Troell's grand, deliberate, but nonetheless astonishing schema. (It may also have to do with the superhumanly high bar that this actress sets for herself in other work.) So little is Ullmann interested in knocking our socks off or bending her scenes to privilege Kristina that when The Emigrants ends, you may have trouble, or at least I did, remembering exactly how the character looked or where she was for her final shot. One of the other co-leads is gloriously settling, and one is ardently commencing yet another voyage. Both impressions are indelible. Whether Kristina, though, has a sense of having arrived or of only now embarking on a new voyage is much less certain, and as we've learned from Ullmann's performance, it probably has less to do with physical locations than with spiritual soundings. Gazing at Ullmann at any given time, you learn plenty about the character, and you desire to find out more. While taking in the full scope of The Emigrants, though, you occasionally lose track of her completely, or you realize you haven't seen her lately and start scouring the corners and the backgrounds of the group shots. 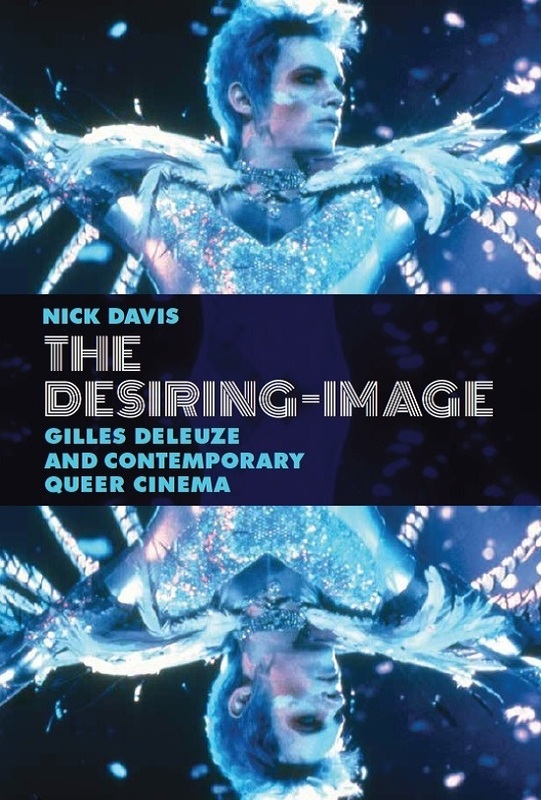 Given the way the actor and filmmaker have collaborated to conceive Kristina and to integrate her within the novelistic riches of The Emigrants, all of these responsesfixated, distracted, and curiousare equally suggestive of how fully Ullmann warrants our praise. BONUS: Notoriously, Ullmann lost her shot at a third nomination when an arcane AMPAS rule prohibited the Oscar eligibility of Scenes from a Marriage in 1974. It isn't simply that Scenes debuted on Swedish TV, albeit in a much longer form, but that this broadcast and the U.S. theatrical release failed to coincide in the same calendar year. I read in Inside Oscar about the ad taken out in the Los Angeles Times by a group of actresses who wanted Ullmann to be considered, and while preparing this post, I decided I had to see it for myself. 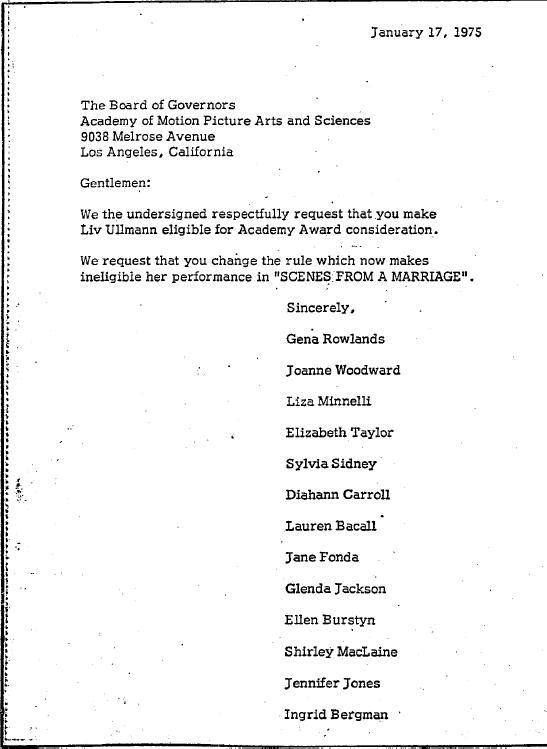 So here you go, a top-drawer artifact of actressexuality, straight from page F12 of the Times on January 17, 1975. Now that's what I call the approval of your peers. Sometimes it's just an honor not to be nominated! Anyway, this piece was totally worth the wait, and not just for that astonishing artifact you excavated -- most commendably selfless, perhaps, is Diahann Carroll, whose Oscar spot likely would have been taken from her had Liv been deemed eligible. Right? As always you've given me more to see and ponder in a film I already love -- thanks to you, I'm already thinking I might find more to love on a second visit. 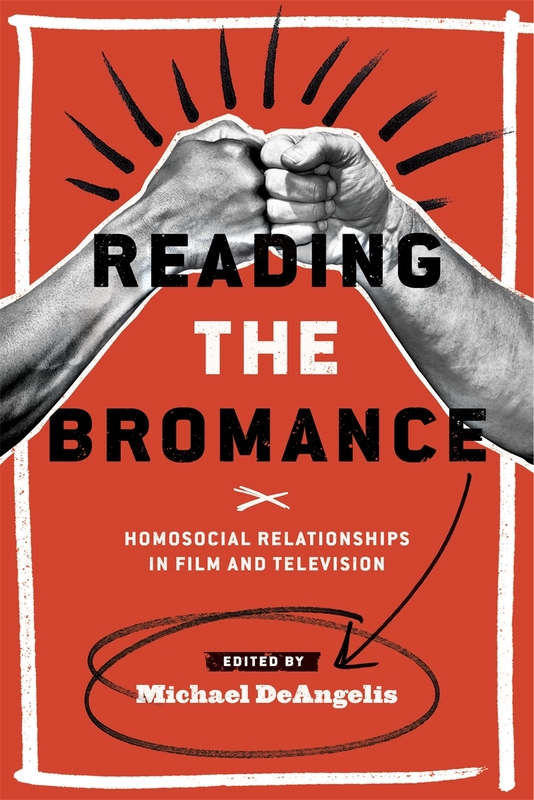 I particularly like the kinship you draw between Ullmann and Tyson -- as peerless as Ullmann's collaborations with Bergman are, I'm glad she also got notice for warmer, more permeable work like this. She really is the bee's knees. Indeed you did, and that's one of my favorite Oscar-related articles I've ever read, so I'm glad you linked to it. As many times as I read it when you published it, I can't believe I didn't comment! I suspect Carroll might have been on the chopping block had Ullmann gotten in for Scenes, although Perrine, about whom category confusion abounded (she won the NYFCC prize as Best Supporting Actress), shouldn't have gotten too comfy, either. And I absolutely agree that seeing Ullmann nominated for something outside her extraordinary work with Bergman is very appealing, even as I wish she'd made the list many, many more times. Thanks a lot for that amazing link! Having all those actresses campaign for you must sure make up for not getting an Oscar nomination! Yeah, Perrine not being on that list is probably due to her being lesser known (then again, it's hard to gage who was "lesser" known 35 years later). Ooh, and something tells me this blog is going to be partying like it's 1954 soon. I can see why you were eager to share this. Beautiful piece! I found the analysis of the way many actors play "period characters" very interesting and I'm wondering if you think only one way is the right one or if it depends. Personally, I think the mannerisms should be historically accurate (Though we can't really know how people behaved before cameras were invented). And don't get me wrong but you made me more interested in watching Sounder than The Emigrants. The way you describe Ullman's performance makes me think (I stress that I'm talking about myself) that I would admire the performance more than love it. off-topic: At the side-by-side page you have Colbert as your favorite for the wrong movie and the title "A Tree Grows in Brooklyn" links to the Mildred Pierce page. But, really, write pieces like this one and make as many mistakes as you want. You've earned it. @John: Oh, I didn't mean to sound I was presuming anyone's bad faith in not signing the petition, just that Carroll might not have been the "fifth" nominee. And not just because I love the movie and the perf. And yep, my living room TV is already partying like it's 1954! 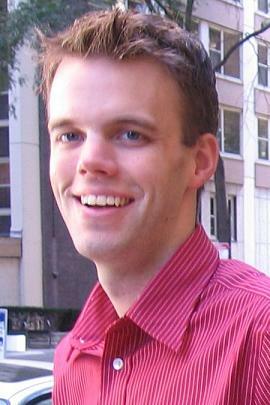 @James: So glad you enjoyed, and do check out Sounder. I actually find it really gratifying that people can read these write-ups and still tell whether they would like the performance or not; makes me feel like I'm not just ignoring aspects of the perfs that could go either way. And thanks for proofreading for me! I do like catching those kinds of errors, or having them caught later. I fixed the Tree mistake, though the other one actually isn't. I actually found a note to myself, written when I saw Imitation of Life a year or so ago, that says, "You're going to forget this immediately, but really, Colbert is EVEN BETTER here than in It Happened One Night!" So, here's me, listening to myself! Dammit! Now I have to admit I didn't know the film and feel guilty about not checking properly. I did think it might have been right and went to imdb.com to learn about the movie but I only looked at the first link which was to the 1959 movie. I love that when you feel differently you go and make the change. And today I found out you have rankings of the director, actor and supp actress winners! Why do you keep them obscure? I found them accidentally and even if they are in the not-eye-friendly color combination and haven't been updated for some years, I'm sure I'm not the only one who thinks they're worth checking out. @James: Don't apologize. Like I said, I'm glad to have the errors caught. About your earlier question on period performances: I'm equally persuadable to all kinds of approaches. I love what Ullmann did here, in sync with the movie's own style, and I find it so much the RARER choice that I risk sounding like it's a categorically better way to play period. I don't think that, but I'm excited about unexpected techniques. And for those other pages - you sleuth, you! I do change my mind often and those were written so long ago, I don't even remember the rankings. I'll have to go look. I didn't even know they were still out there! I AM IN LOVE WITH THAT TIMES AD. I saw this movie a few years ago. Pauline Kael's rave review really got me excited about it . . . but dear God, was this movie plodding--and Liv just simply walked through it. Give me Liv when she's having a psychic breakdown ("Persona", "Face to Face") and I'm happy. I think 1972 is a very interesting year for this category: two nominees give what are quite possibly the greatest musical performances on film (Minnelli and Ross) and see their film careers go down from there, a great actress miscast and going off-key (Smith), and two other great performances doing bland work (Tyson and Ullmann). I meant "downhill," not "down" and "performers" not "performances"